It’s all about design, design is everything. It's this devotion to design that creates truly elegant climate control; smart technology that ensures the ultimate in comfort for contemporary interiors. 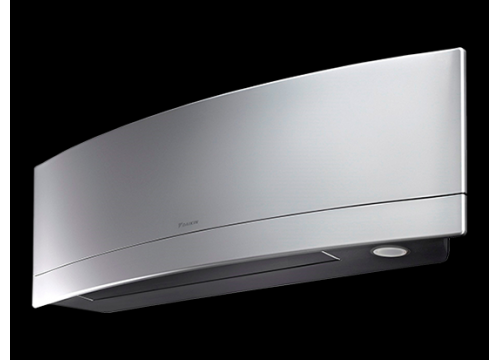 And it's why Daikin Emura is winner of the world renowned 2014 Red dot award for product design. The Daikin Emura is the result of ongoing research into creating superior air conditioning solutions for European interiors. The first Daikin Emura was released in 2010 and this iconic wall-mounted air conditioner redefi ned the notion of climate control in European interior design. The new generation adds even greater functionality, making it ever more relevant to European architectural aesthetics, technical standards and user demands. Daikin Emura systems are on the Energy Technology List, so eligible for tax relief. Daikin Emura once again proves that intelligent design can look great and deliver superior energy effi ciency in climate control. It ensures the indoor environment is optimised, so architects, engineers and customers get the perfect solution. Air-to-air heat pumps extract 80% of their output energy by transferring ambient heat from the air around us. Advanced energy-saving technologies, such as re-designed swing compressors, deliver high energy efficiency for optimum performance.